If you have any questions or want to enquire about dates, use our form to contact Anna Addario-Chieco or see their website for more information. In the centre of Spongano, the courtyard walls of this 18th century masseria drip with creepers and geraniums; in front, across a little road, is a verdant citrus grove worth resting in. All this is part of a vibrant working farm. 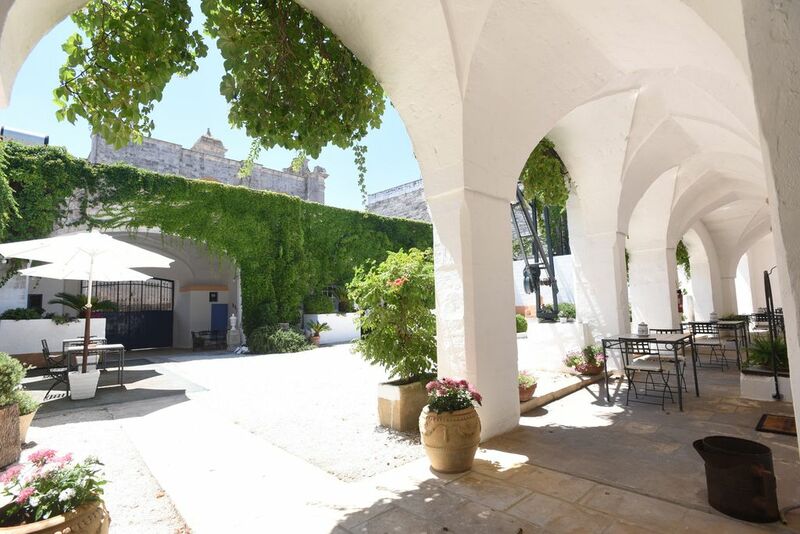 Go through the massive gates and the Moorish-arch portico and you will leave the narrow village streets to enter a white-gravelled courtyard with wrought-iron tables and chairs. Ground-floor apartments have been carefully converted into a series of airy, old-style rooms. Walls are colour-washed warm yellow, ceilings are lofty and vaulted, and there’s a vast roof terrace. One apartment for two has a dining space squeezed into an ancient fireplace, bathrooms have pretty mosaic mirrors, most of the kitchenettes are tiny. Cakes and marmellata are served for breakfast in an impressive stone-vaulted room which leads out to the pool. La Macchiola is devoted to the production of organic olive oil and Anna’s family make some of Puglia’s finest oils. Cooking, yoga, pilates and ‘pizzica’ dance classes can be arranged – you can even get married here. Beaches are a short drive. Breakfast €7 for self-caterers. Dinner by prior arrangement €35. Restaurants 200m. La Macchiola is a charming and comfortable B & B and Anna was most welcoming. The courtyard and pool area are beautiful, well attended and full of flowers. The rooms are spacious and well equipped. An absolutely beautiful residence with a very comfortable and attractive room. Anna was a delight and was very welcoming and helpful. She was always very eager to be any assistance possible. The breakfasts were superb and varied. The staff were wonderful and we were always made to feel very welcome and, indeed, special. A wonderful retreat in the middle of the Puglian countryside. I would definitely recommend a stay here. Such a treat. In La Macchiola there are four bikes available to borrow for any cycling trip you want to do in the area. If you, instead, want to stay in the house you can play a match with the table football. The Saturday market in Poggiardo is rich in scents and colors of fresh fruits and vegetables to buy and taste. The ovens churn out fresh bread and fragrant 'friselle', seasoned with the best olive oil from our ancient olive trees. There is a summertime folk festival on May 1st in Diso - a typical village 2km away, famous for their spectacular light decorations and popular music.All summer villages offer fetes with music and street food. The clear sea is 5 km away and is waiting for a dip or a boat trip to discover the caves. It is also interesting to visit the cathedral of Oranto and walk along the castle's high walls. In the Autumn e Spring you can book onto workshops and courses: cooking, 'pizzica' (salento dance), yoga and pilates.